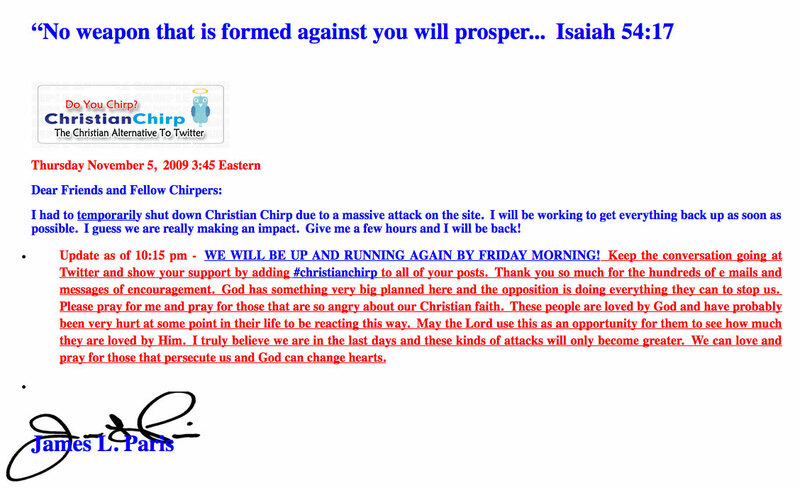 If you haven’t heard about it yet, Christian Chirp is a new Christian alternative to Twitter. In and of itself, that’s funny. I’ll let you revel in it. Now go look at the site. It’s down right now because of a massive attack (screenshot). Must be the persecution of the last days. No seriously. That’s what founder James L. Paris blamed the attack on. That’s funny. The mustachioed Paris has a Twitter account. And a financial advice site called Christian Money. Then there’s Christian author and humorist Matthew Paul Turner who discovered Christian Chirp and went from incredulous to curious to #1 chirper to deleted in less than 24 hours. That’s funny. If you like Turner’s irreverent take on faith, you’ll love his skewering of Joel Osteen. Then Michael Hyatt, CEO of the Christian publisher Thomas Nelson made a comment about Chirper being a Christian ghetto, prompting multiple responses from Paris. Christian media “mogul” cat fight. That’s kind of funny. Paris’ best insult? Pointing out Hyatt’s publishing history, which includes a trio of Y2K survival books (one is a novel!). OK, no disrespect to Hyatt, but that’s hilarious. When it gets less funny is this blog post, the Truth about James L. Paris and Christian Chirp, alleging that he lied about being banned from Twitter (part of the ethos of Christian Chirp), that he censors Chirp content and that he was indicted for securities fraud. The comments get even uglier as Paris himself shows up to argue the charges. Oh, Christians. And we wonder why people think we’re so weird (I mean persecuted). Musician and rabble-rouser Justin McRoberts has a good take on Christian Chirp. It’s not ha-ha funny, but it’s good. I think it’s great! I mean, you remember how God told us not to associate with those other people! This way, twitty Christians can be safe from potentially being exposed to those non-believers, or even letting them read their twitty postings! What we really ought to do is build whole separate Christian cities, just so we never have to see them at all. So many people look at things that happen and call it persecution. Persecution against Christianity only happens when someone attacks you simply because of your faith. I don’t know if that is the case here, but the response on the page is good. He asks for Christians to love and pray for those who are against Christianity. Is there anything wrong about that? Wickle, thanks for the idea about Christians being in their own towns so you won’t have to see them. But in all honesty, what would the world be like if that happened? Most hospitals are owned by Christian denominations. Admittedly, they are not typically run in a Christian manner, but they started out with Christians seeing a need and wanting to meet that need. Christians have done more to hurt the church in the past several years than anything else, and I honestly hate that. However, rather than judging every Christian and Jesus Himself by what a few ignorant (people who may not know any better because they are human) people do, why not pick up the Bible and start reading the book of Luke. Find out who Jesus really is. If you don’t have a Bible just take a look at biblegateway.com. Good one, Kevin. The worst part about this has to be Michael Hyatt’s side of it, because now we all know of his involvement with the Y2K panic. (It’s news to me, at least.) That’s one skeleton you KNOW he wishes had stayed in the closet. I echo Wickle’s sarcastic and right-on-target remarks. I don’t know why some Christians feel the need to be so embarrassingly ridiculous as to make the rest of us look crazy by association. Right on, Jason. Isn’t that wild? If you search his blog, he refers to his previous books pretty vaguely and I think he actually mentions Y2K only a couple times (one was this morning). What’s the deal with that? It’s not like you can keep that secret hidden. That’s the kind of skeleton you proudly display and join others in mocking so no one else can discover it.